Inspecta Crack® uses the latest windscreen repair technology to repair windscreen chips of all types. Our Windscreen Chip Repair process restores strength to your windscreen and improves visibility to a windscreen that has been damaged by a rock, roadside debris or a loose item that has escaped from another vehicle. Repairs are only performed by a qualified repair technician and most will result in 80% - 95% improvement in visibility depending on the extent of the initial damage. Inspecta Crack® technicians use the latest equipment capable of removing air in the damaged area and replacing it with the highest quality non-yellowing glass resin that will prevent further damage and improve the finished look of the repair. When should you get a windscreen chip repaired? Modern windscreens are made from a high-tech "sandwich" of plastic laminated between two layers of glass. 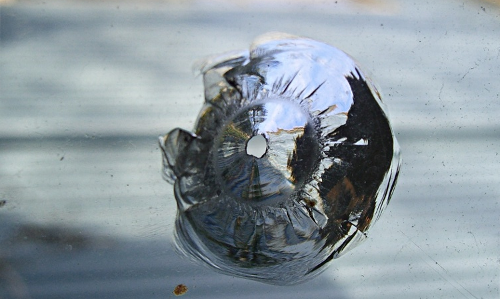 An impact strong enough to chip the hard outer layer of glass can cause an infinite variety of chips, cracks, crescents, stars, or combination breaks. Often, the imperfection is tiny at the surface and expands into the familiar bulls-eye shape as it spreads toward the centre layer. The longer you wait to get a Windscreen Chip Repair the more likely it is that it will expand into a crack and require a much more expensive repair or even a windscreen replacement.